In the past week I had a lot of success finding bad weather. Jim Edsall and I did workshops for staff at three National Parks and at Sydney for their naturalist club. We only managed to document butterflies during the Sydney outing! That said, what we did manage to document proved quite interesting. Through most of the Maritimes the elfin flight is nearly finished, with perhaps only a few ragged individuals still on the wing. 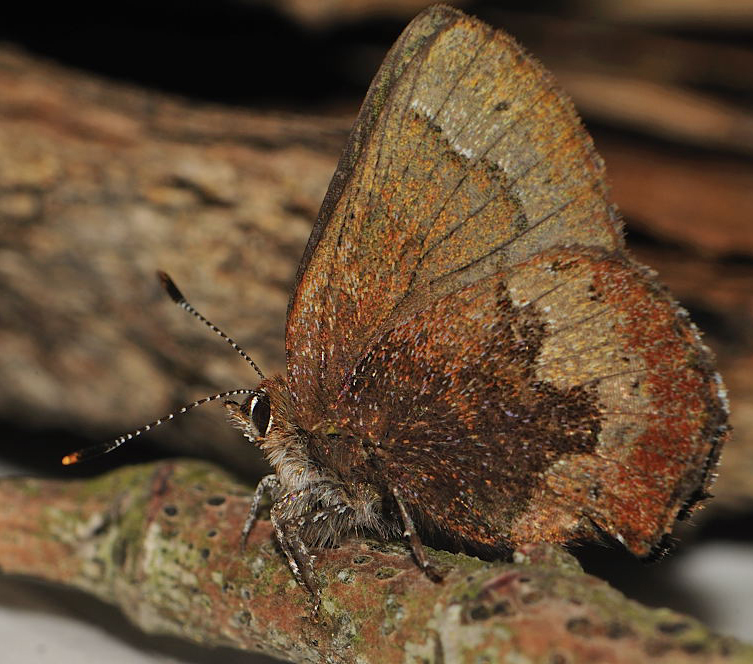 The Brown Elfins documented at Sydney didn’t show this wear however, they appeared quite fresh, suggesting they had only recently emerged (see photo below). Just what this means isn’t clear, but it could indicate that the Cape Breton Brown Elfin population emerges much later than those on the mainland, perhaps an adaption to cooler Cape Breton springs. It will be interesting to see if late emerging Brown Elfins are documented in Cape Breton in future years. Fortunately Jim and I met a a number of very keen naturalists from Sydney that will be able to document this. There were some other significant observation from the past couple of weeks. Richard Mash documented Jutta Arctic in Guysborough County. This is the first county record for this very rare Nova Scotia species, it is previously known from the Mount Uniacke area, a couple sites in Cumberland County, and Cape Breton Island. Hoary Comma, a species not well documented by the Atlas, was recorded by Martin Turgeon and Reggie Webster in Restigouche County. Chris Adam had Pepper and Salt Skipper in Fredericton and Tony Thomas had Roadside Skipper near Upper Gagetown. Species that should start to fly in the next couple of weeks include Bog Copper and Baltimore. Try any boggy habitat with cranberry for the former, and wet areas with turtlehead for the latter. We are also getting into skipper season. These can pose an identification challenge. To help with identifications, check out the videos at http://www.rkwalton.com/skip.html. These guides to the Northeast cover every maritime species, plus a number of species you’ll only encounter further south in New England.